Why You Will LOVE a Pressure Cooker! A couple years ago I was interviewed by a magazine and asked what was it that I couldn’t live without? I replied that other than my husband, I couldn’t live without my pressure cooker -- but it was a close tie. I am so absolutely in love with all of the features of a quality pressure cooker, that I’m out to convert every person who considers themselves a cook, or concerned with emergency preparedness. When I mention a pressure cooker to most, they have images of one blowing up in their grandmother’s kitchen, or at least making some frightening hissing and clanking noise. A lot of people only think of a pressure cooker for canning. But here’s the good news. You can cook like an absolute pro in no time with a pressure cooker today. They’ve come a long way since their initial popularity during World War II. And the good quality ones are a must in every kitchen. The one that I highly recommend is a Kuhn Rikon. It has 3 safety features on it and has a fabulous quality otherwise. But let’s cut straight to the perks of a pressure cooker. Bottom line, if I had to choose between a microwave and a pressure cooker, I would hands down go with a pressure cooker. You’re reducing the cooking time of at least two-thirds and yet you don’t sacrifice flavor, tenderness, or quality. Here are a couple of examples of cooking times: whole beef or pork roast with the BEST gravy every - 45 minutes. Artichokes - 15 minutes. Whole, long-grained rice - 5-6 minutes. 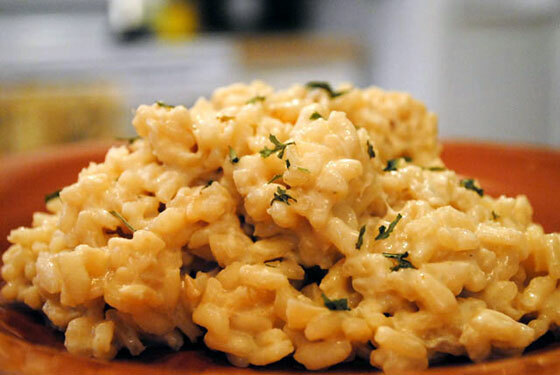 Risotto - 8-10 minutes. Cheesecake - 12 minutes. Frozen chicken breasts - 10-12 minutes (and VERY tender). Mashed Potatoes, 3-5 minutes. Whole lamb, 35 minutes, etc, etc. Do you love a good pot roast? How about creating a fabulous pot roast with the most effortless savory gravy in under 45 minutes? Once you make mashed potatoes in this thing, you’ll wonder how you ever did without it. How about getting home from work wondering what in the world to prepare and only see frozen chicken breasts in the freezer? With a pressure cooker you can take those frozen chicken breasts and a jar of BBQ sauce and have a yummy, tender chicken dish in less than 15 minutes! What a pressure cooker does is exactly what the name implies. It creates a hot sealed pressure within the pan to cook anything inside. You’re creating 8 pounds of pressure per square inch above external pressure. Typical boiling heat is 212 degrees. However, with a pressure cooker, you’re cooking on high at 254 degrees Fahrenheit. Due to the sealed system, your not losing any of the flavor or moisture from your food, in fact, you’re infusing it! You will need less water, less spices, less fuel for heating and less time with your pressure cooker. Here are a few of points that I love to make when it comes to using a pressure cooker. You can make so much in a pressure cooker—from roasts, to stews, even to desserts such as cheesecake. Even if you have some meat that’s suffered a bit of freezer burn, you can salvage it in your pressure cooker because moisture is infused into it. So long as you have sufficient moisture/liquid in your dish, you don’t have to worry about over cooking or burning a dish. A meat dish, for example, may not end up turning out in the consistency you had imagined should you forget about it for a few minutes, but it will still be tasty. It just may determine whether you need a knife or not for the dish. I love to dump a bunch of chicken in the pressure cooker, cook it about 7 minutes per pound, and then just use a fork to shred it with—effortlessly. I can then use the broth for other dishes and the chicken for the myriad of casseroles I make. Add just a tad bit of veggies and you’ve got a very inexpensive chicken broth. Foods are healthier with a pressure cooker. When you cook green beans, peas, or broccoli, you’ll discover that even though their sufficiently cooked and tender they are still a beautiful green. The reason is the nutrients and color don’t escape with the evaporating steam. It stays in the pan under pressure! The pressured steam actually intensifies the flavor of your foods, so your vegetables actually taste fresher! Instead of boiling the pasta, then making the sauce and adding everything else, you can literally throw it all in there and end up with a GREAT dish. When you cook potatoes for mashed potatoes dish you will notice a difference when you prepare the potatoes in the pressure cooker. You do not need to cut the potatoes in small pieces. I usually just cut the potato in fourths and then cook them. You will need very little mashing afterwards, and you can easily add garlic to infuse a yummy taste in your potatoes as well! When you make a pot roast (or any kind of roast) you can seer it right in the pressure cooker, then add your liquid and seasonings. Cook the meat and then the last 10 minutes you add the vegetables. When you’re done, you will have a YUMMY gravy that’s just the right consistency as it will be naturally thickened with the starches in your potatoes and carrots. And the roast will be fork tender as well! Ooh. I’m getting hungry just writing about this! Artichokes typically take about 45 minutes to cook. Only 10 to 15 minutes in pressure cooker though, and they are much more flavorful! Rice and risotto cook effortlessly in a pressure cooker as well. And you can really spice things up with small amounts of seasonings too. In the event of an emergency, if you need to conserve water, fuel, and personal energy, a pressure cooker will really come in handy. If you bring the pressure cooker up to high pressure, you can turn off the heat source, wrap the pressure cooker up in towels, and then continue to cook the contents for as much as another hour (Not that I can think of anything that takes an hour to make in a pressure cooker). Even in everyday cooking you will find that it takes significantly less fuel or electricity to cook your items. Bottom line, there’s a whole new world of successful cooking waiting for you with a pressure cooker. And it’s a great asset in the event of having to cook in an emergency. In fact, in many of the European countries that don’t have a reliable source of fuel and electricity whenever it’s desired, you will see 2 or 3 pressure cookers in every kitchen. It’s a realistic way of life for them. And it’s an exciting way of life for you to take on. It makes your life easier, your food healthier, and maximizes your time in the kitchen. So give it a try. You’ll love the benefits now and later. Here’s one of my favorite recipes for a pressure cooker. It’s a luxury comfort food. I like to buy the Italian cheese mix at Costco - it comes in a clear plastic container. Marie, I also wanted to share with you about standard cooking times for rice and beans. The good news is when you cook beans you do NOT need to soak them overnight. Yup, another perk. Cooking rice in a pressure cooker is faster than in a rice cooker, actually. for 5 minutes. Remove cooker from heat. finger-tip control lightly to release pressure. I'm one of those people who would be nervous to use a pressure cooker, but when you mention the lower energy use, it makes me want to know more so that I could use it regularly and in emergency situations. Are there guidelines/cookbooks/instructions available for many different recipes (i.e. rice and beans) for staple items? Thanks for your comment. Again, I can't say enough that pressure cookers have come a LONG ways since the scary days. When you purchase a Kuhn Rikon pressure cooker, it comes with complete instructions, recipes, and hints. I also love the cookbook called "Cooking Under Pressure." (sorry, can't remember the author's name) Warning, once you start pressure cooking you won't stop. You won't think twice about "whipping up a roast" or "punching out a chili." The author's name is Jane Sass, and all her cookbooks are excellent. I second the recommendation on "Cooking Under Pressure". I'm definitely intrigued now, and will be looking into it more--thanks for the information! i hope the curry recipe works out well! ok, you've talked me into it. i'll drag mine out from the very deep recessess of the cabinet and dust it off. i figure i can at least use it to cook some rice in. What a great post. We've got to keep on reminding people about why a pressure cooker is so great. I use mine almost every day. I am sure that it gets a better workout than my husband many days. Although I love him more, some days it's a toss up. That pressure cooker doesn't talk back, ever. Can't imagine why anyone would put their cooker in the back of a cabinet. Mine lives on the stove, ready to go. Hi, how do we make pasta with sauce in a pressure cooker? There are several recipes on line, but the bottom line is, you throw in your sauce and your pasta at the same time, cook it, and viola! OK. Now I am getting a pressure cooker! I love pressure cooking recipes! Thanks; I hope you might get a kick out of these as well. I just found your blog today and have been reading for a couple of hours now! I love it! I am particularly intrigued by cooking with a pressure cooker. Like many people, the obstacles that have kept me from doing it in the past are safety, education and cost. I apreciate your recommendation of pressure cooker that you feel is safe. I was looking into the Kuhn Rikon pressure cookers and wondered which size you would recommend for a family of 5 (and growing) that cooks from scratch often. We usually make enough food for us and then have leftovers that we freeze and eat for lunches or send with my husband to work. Would you recommend getting the 5 quart or the 7 quart? Also, do you have more than one pressure cooker? (not that I'll be getting more than one anytime soon! ;) And any recommendations of where to purchase a pressure cooker? From the Kuhn Rikon company itself, Amazon, Ebay, etc? Stephanie, glad you benefitted from the article. I have 3 pressure cookers, cause I use them ALL the time, and I don't want to be slowed down even when I'm making a nice spread for company to enjoy. Yes, exactly. Otherwise your veggies are mushy. I take the roast out at this time, tent it in foil and let it rest. Hey Everyone, I need a little help with a pressure canners. Because of this website (thanks Kellene!) I fell in love with pressure canning. I had bought a All American new #21 and used it so much that I purchased a second one off of ebay, #15. This one is a vintage on with a stem type pressure value. My new one has a weight that I just set on the stem at 15#. Can anyone tell me how to set this stem type to 15 lbs?Does this make sense to anyone? I have never seen this old style of release valve and really can't find anything on the internet on how to set it. Thanks in advance! After seeing Kellene Bishop’s You Tube video I just had to have one, I purchased a 7 ¼ qt Kun Rikon from Amazon and all I have to say is , Incredible!! The day it arrived, after work I cooked 2 racks of fall of the bone ribs and finished them off on the grill in less than 45 min. Usually I would have waited until the weekend due to the cook time involved for the ribs, needless to say the family was pretty impressed. The Kun Rikon will be getting a lot of use! Hi, fab' write up thayt I have decided to invest in a pressure cooker and yes a kun rikon!! Anyway, what I'd like to know is 'exactly' how i would go about cooking frozen chicken breast/thighs and what about frozen mince ?? I have no idea what "frozen mince" is, but as for frozen chicken, you just put it in the pan, put enough water to give you about an inch at the bottom of the pan (I use chicken broth instead of just plain water) and then run it at high pressure for 10 minutes per pound of chicken. It's super duper easy and there are some great recipes that came with your pressure cooker too. Can you use this type on a glass cooktop? My pressure cooker is one of those ancient ones that used to belong to my mother and I used to use it for everything. The Time saving device is a wonderful part of cooking. When we have time slots of electricity usage is a perfect time to have a pressure cooker...we have been out of the country serving missions (6 total as a couple) and in Mexico and South America the electricity is not always available and they don't sell pressure cookers here, so it makes me appreciate the conviences we have and what we can do in much less time. thank you for all you do, all your idea, recipes, videos...etc. Any free time I have I'm into your site because you've given so many people so much with your experience. You're the most amazing prepper we've ever seen and LOVE to follow all you do. Thank you again. What a sweet Christmas Gift you've given me, Gennie with your kind comments. Thank you very much and thank you SO much for your mission service!! How wonderful! I was in the house when a pressure canner blew up in our kitchen. I was only 8 years old and thankfully we had just stepped to the dining room for a break for my mom. The kitchen filled with steam that would have seriously injured anyone in there. So, when my daughter talked me into this pressure cooker she assured me that that canner was old and not like this pressure cooker. Many safety features on this one. She had to talk me through the whole process of meatballs (which were very good and easy) long distance. I went through the directions and when I finally got to setting the timer I left the room and hoped for the best. In 8 minutes dinner was done and no blow ups. I turned the pressure valve and nearly had a heart attack when the pressure went out. It was pretty funny but pretty exciting when it was all done. I am sold on the whole thing. Get going gals. I am 75 yearxs old! If I can do it so can you and you will be glad you did. You mentioned making a roast then throwing the veggies in right before it's done? So you bring down the pressure and throw in the veggies and bring the pressure up again? I never really knew about pressure cookers until I read about them on your site. I see that you recommend the Kuhn Rikon. What size do you recommend? Is bigger better? I have an electric pressure cooker that I bought off an infomercial (PressurePro) and the instruction booklet that came with it is the PITS. Any suggestions on cookbooks for electric pressure cookers? Will the one you recommend above translate, do you think? I just spent so much money, I'd like to use my cooker more. MandyK, the good news is that you have a lot more possibilities with an electric pressure cooker than you do with a regular pressure cooker that I use most of the time. Other than it being useless to you in a long-term power outage, you'll find that you love, love, love working with it. The instructions and recipes will be the same as they would for regular pressure cookers, except you won't have to have the same cautions due to the finish on the electric pressure cooker. So I'm sure you'll be plenty happy with her cookbooks. Good luck!! I am a hairstylist, and my client mentioned a pressure cooker, so I got a Fagor 8QT. I think I have a serious addiction to pressure cooking and everybody's making fun of me. Being a hairstylist, I mention to all of my clients how great they are and everyone should try them! One lady said she did hard boiled eggs! I tried it! They practically peel themselves! 4-6 minutes!! Fresh eggs, and you can pack them in a steel basket, or perch them atop an olive oil lid with the plastic removed. I'm having fun researching all of this stuff! I came home from work and my husband started his first meal in the pressure cooker and knew I'd be upset because I am having a lot of fun with it! We actually joked about who should get to cook! Thanks for your previous info!! I LOVED reading of your enthusiasm for pressure cooking!! I'm so happy you loved it! I'm so happy you loved it! Thank you for blogging about it! I think there should be more info out there to demystify the pressure cooker. My husband is going to make bean soup, then I bought tons of wild rice and quinoa to try also.